The next SEARS monthly launch is December 6th in Samson, AL. The event is Drag Race Day. A drag race is two or more rockets launched simultaneously. Challenge anyone to a drag race. Use a green flight card for the drag race so we can draw the winner. It is nice when the rockets and motors are matched to make it fair. But not required. Anyhow I don’t know how you score a drag race but it is fun anyway. We will be also having a Almost Anything Goes Drag Race on the Mass Launcher. Launch any rocket that will fit and fly nicely on our short 1/8 inch rods. Load them up! As always Christmas themed rockets are encouraged for the December Launch. So bring your creation. The November 1st 2008 SEARS launch proved to be an excellent day for flying rockets. The sky was cloudless and temps around 70 in the PM with a light breeze. The event was Cluster Day. Not sure how many we had yet. Russ Roberts won the event. He picked out an Fliskit Proconsul (Like a Drake) from the prize pool. 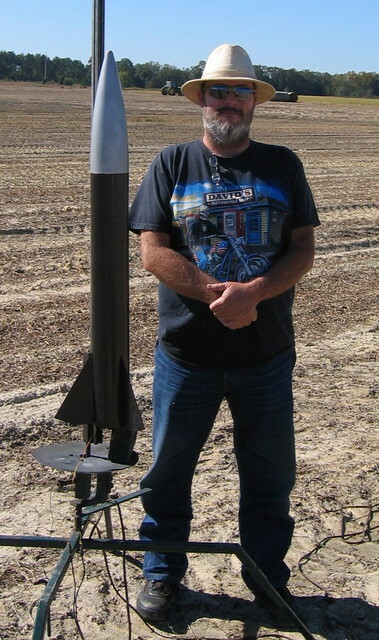 Dave Brassell of Panama City made a sucessful Level 1 cert on his LOC Bullet four inch rocket. The rocket flew on a Aerotech H148 redline motor. Congrats Dave! Roy Houchin of Shorter, Alabama has joined SEARS. Roy is a NAR member. He flew his Estes Skywinder at the launch. Roy is the historian for the ARCAS sounding rocket and has a lot of the hardware. Maybe we can do some type of ARCAS club project. John Hansel flew his Old Blue which is a four inch Performance Rocketry Intimidator (I think) an a K motor. It went over 6000 feet and landed off the field at the creek. It was drapped across several trees and required chain saw recovery. Bob Stetson flew his Apogee Aspire on an Apogee F10-8. This combination sims out to a mile high. Apparently the shock cord frayed. Bob Stetson recovered the nosecone and Rick Gutknecht found the rocket body later. We were glad to have Doug Harrell who teaches Science in Bristol FL attend. He brought his wife and some members of the Liberty County High School Team America Rocketry Challenge (TARC) team. Rick Gutknecht and Arron Gutknecht of Panama City attended. Rick flew his Halverson Wicked Winnie and Arron an Guardian Estes rocket with a nice paint job. Bob Mullins flew his “Flame On” six inch Rocket on an AMW L1800. It was great boost. The main did not come out but the rocket had no damage, Thanks to Bob for bringing his EZ-GO rocket cart. It got a real work out. Dave Brassell and his LOC Bullet. 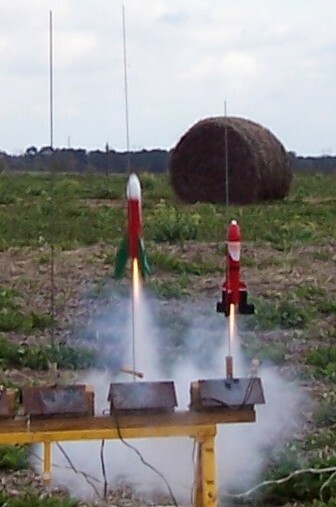 You are currently browsing the SouthEast Alabama Rocketry Society weblog archives for November, 2008.